SCARBOROUGH — Northeast Technical Institute presented Camp Sunshine with a donation of $10,000. 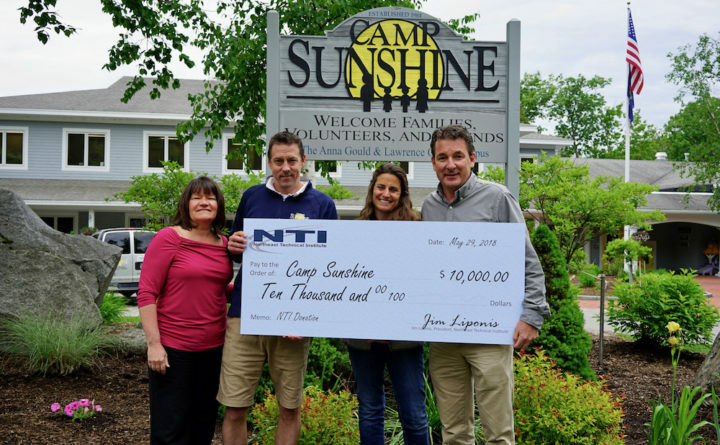 Northeast Technical Institute donates a portion of its application fees to a local charity, and, once again in 2018, Camp Sunshine was the recipient. Founded in 1984, Camp Sunshine provides retreats combining respite, recreation and support, while enabling hope and promoting joy, for children with life-threatening illnesses and their families through the various stages of a child’s illness. Camp Sunshine’s program is offered year-round and has the distinction of having been designed to serve the entire family in a retreat model. The program is free of charge to families and includes on-site medical and psychosocial support. Bereavement sessions are also offered for families who have experienced the death of a child from a supported illness. Founded in 1995, Northeast Technical Institute is the region’s leading provider of short-term, career focused training. With campuses in Scarborough, Bangor, and Lewiston, courses are offered in health care, information technology, commercial truck driving, HVAC/R, and manufacturing. Northeast Technical Institute’s programs are accredited through The Council on Occupational Education.